I was so satisfied with the Fake Febreeze for 15 Cents, that I began wondering what other common household cleaners I could make on the cheap. There's tons of resources out there for DIY cleaners, but I want to REPLICATE as closely as possible the Real Thing! Probably the Number One Cleaner I use in my house is Windex. With 4-year old, AKA "Mr. Sticky Fingers" and Scottie Dog, AKA "Mr. Greasy Nose" in the house, I use it a lot! In all honesty, I have tried to use the Dollar Tree version of Windex. To me, it just seems too watery and it leaves lots of streaks. Guess some things are just not the same as the name brand....until now! Isn't it nuts how most of what we're paying for is WATER? Anyway, I tried this "refill" of my Windex and it's awesome! No streaks & it even smells like the real thing! *If you purchase one bottle of Windex per month (and I sure do), the savings comes to $41.04 per year! For cleaning windows and other streaky surfaces, I cleaned all of my windows once with the good terry cloths to get all of the old cleaner residue off... and now i just use a bottle of 1/2 vinegar, 1/2 water, with a few drops of dawn dish soap. No streaks and they look super clean. I have 2 indoor cats and a huge dog, so there are plenty of nose/slobber prints to clean off all the time. And my favorite part is it doesn't dry my hands out or burn my lungs. I have been using a bottle of about 1/4 vinegar to 3/4 water as an all purpose cleaner, mirror and window cleaner. Works great, no streaks. And, since I can buy a gallon of white vinegar for less than $4...... you can imagine the savings. Try adding a teaspoon of cornstarch to your recipe. Makes windows sparkle. I have just started clipping coupons but this would still be a cheaper way to go! Thanks for posting and I will be sure to check out the other savvy savings ideas you have on your blog!! Thanks for sharing the alternatives! What a great way to save money with the way the economy is now! Thanks for sharing! I'M LIKE YOU,I REALLY GO THRU THE WINDEX. THIS SHOULD SAVE ME A BUNDLE! THANKS FOR THE TIP. Being that I clean houses I purchase alot of products. I have everything listed above that I would need to make this so I am down to try it for sure.....and save money? Count me in! Thanks for the great tip. This is awesome! And a great way to save on all that WATER! I can't believe what a rip-off it can be. Great idea. Wow so great! Thank you for sharing! I'll be pinning this for when I run out of Windex. This is awesome! I am going to do this when my bottle runs out. I am pinning you on Pinterest! Thank you!! This is one area I have been fortunate in. I have won several blog contests for cleaning suplies. I have a years supply of bleach (and I use that daily) and 2 gallons of windex (the real stuff) plus other cleaning supplies just by entering online contests. When I do run out I am sure I'll be refilling those bottles with home made ingredients. i havent checked out the febreeze recipe yet but ive been making my own window/surface cleaner for years! its so fun to just throw it together. i make larger batches and i also use distilled water to reduce spotting... but i suppose i dont have to! lol ive tried making shower spray but so far i havent found the combo that works for me. Wow! Thanx for this...pinning NOW!!! for the stains and ring inside the bowl, but won't have a harsh scent. Anyone got any ideas that wil actually work? These r wonderful an cheap ideas.Will definetly try all of them.Thanks! I make this for my windows and it also cleans stains out of the carpet- minus the alcohol. It works great. I use a few drops of dawn. THE BEST tub, sink, toilet cleaner is equal parts vinegar and liquid dish detergent. Just spray, scrub, and rinse. It's amazing. If you have mold or something a little more tough, just let it sit for a bit and you will see it literally crumble off! Warning! If you have small children, do not use old food containers to put these cleaners in, unless you properly label them to prevent accidental ingestion and poisoning. I will look into that and see what I can come up with! Stay tuned! Thanks for the question! Oh, this is great! I'll have to try it! Clever! Thank you for sharing! I will def do this! I LOVE your blog! TFS all the great tips! I clean houses for a living, so I would use TONS of Windex if I didn't make my own! I've been making mine for years & the only difference between your recipe & mine, is that I add Vinegar to it & also use distilled water. Works GREAT!! I'm looking for a shower cleaner/ daily shower cleaner... any tips??? Have a great week! I have started using an amazing scum buster! Heat in the microwave 12ozs. white vinegar and pour into a spray bottle and add 12ozs. Blue Dawn. I've given it to all my friends & relatives......they LOVE IT! Thank you so much for the fake windex and febreeze recipes! I've pinned both to my Great Ideas board! I have tried this and love it and use it now. I featured this and your febreze in a round-up at So Very Creative. do you know if it is ok to use the homemade laundry detergent in this? Thanks for the recipe! Hi Marji, I imagine that homemade laundry detergent would be fine so long as it doesn't contain bleach. Bleach + Ammonia = Very Very Bad! Cheers! 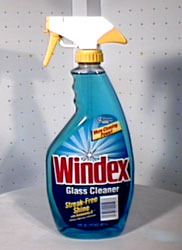 Does your homemade windex come out blue or clear? To Anonymous...It would be 1/4 Cup - thanks for finding that mistake! @Laura - It is clear. Thanks for posting this... I just tried it and loved it much better than the old vinegar based recipe I've been using for years. I could never ask my girls to help with the window washing because it took so long for them to buff it dry. And just an FYI for anyone else trying it, I didn't know if I should use my homemade laundry detergent so I used dish soap instead and am pleased with the results. My dad said they used to use vinegar+water to wash windows and used newspapers to dry them and it works really well! He actually insisted we dry the windows with newspaper because it works best. Looking forward to trying this and the other cleaning recipies you have posted!! We have 3 dogs,4 cats and grandkids.....a girl can go broke buying all these items...even with my beloved coupons!! Thanks for all you do!! I just love it when I stumble on to a 'Domestic Diva's' website/blog! You are GREAT!!! We just made this today and used it to clean the Kitchen. We love it and will continue to make it. Thank you so much for posting this. I was so glad someone posted this to pinterest. I am going to try the Febreeze next I just need to buy some baking soda. I thought this sort of thing was a great idea, until I noticed that I can use PLAIN water to clean my windows, it works JUST AS WELL, Doesn't stink my house up like ammonia products or vinegar, and I get no streaks, and I haven't paid a cent for it. Seriously, try it. What are you using to wipe them with? Just paper towels? This is now my favorite blog site! Nothing cheers my day than saving a bunch of money! Do you have fake 409? It's my go-to product. I've tried a few strong 409- grease cutting type recipes, and the best i've found is mixing equal parts vinegar and liquid dish detergent. the only problem is you have to rinse it when you're done. you might be able to experiment and add water into that mix somehow so you can just wipe away? Word of caution to all the home chemists: Don't experiment with mixing ammonia and bleach. The resulting gas KILLS! It's the same thing they used in gas warfare in WWI! Yes, that is clearly stated in my posts. My husband just about killed us both. I came home and he had poured bleach AND amonia into the toilet to clean it. OMG I took a marker and wrote 'DO NOT USE WITH BLEACH' on the amonia bottle. OMG! My Mom is gonna flip out when I give her this recipe! She has a HUGE House cleaning business & goes through WINDEX like it's goin' out of style! This is AWESOME! I apologize if this is a stupid question... but is white ammonia the same as yellow (lemon scented) ammonia? All I can find at the stores is the yellow (lemon scented) ammonia. I would think that Lemon Scented Ammonia would work the same, but it won't smell exactly the same as regular Windex smells. Perhaps you've discovered something new with Lemon Windex! Works great on pinball playfield GLASS (do not use on the Playfield itself). I'm going to try and make this TODAY! Just made this, it's amazing! I didn't have ammonia so I substituted it with vinegar (more eco-friendly too, i think). I added mint essential oil and it's heavenly! I started cleaning everything glass! Do you have a recipe for granite cleaner/polish? I tried this recipe, but subbed vinegar for the ammonia. It was WAY better than Windex! Thanks for this recipe....it's awesome! sorry!!! i just noticed that someone else corrected it earlier,I just hadn't taken the time to read all the comments. I used it this morning and now it is raining cats and dogs!!!! I just tried this. I used it on the glass doors that separate the screened porch from the house. They were very dirty with marks from the kids and the dog, as well as pollen. They are now clean, clear, and shiny! Thanks for the recipe and my future savings! I only have Sudsy ammonia.... a bit afraid to try his recipe as I'm not sure what's in sudsy that makes it not just plain ammonia. Has anyone tried it with sudsy ammonia? I use purple rags found on flylady.com. You get 3 15"x15" rags (& a bag to wash them in) for $10.49 plus shipping. I use them everyday, and I don't need windex, they work fine with just water. I used them to clean my glass table on my screened in porch, which was covered with dust & pollen and glued in place with rain. It looked awful! My rag got it clean with no cleanser at all. Sorry for the promotional ad, but if you're looking for something safe to use around kids, pets, or someone sensitive to strong odors, give it a try! On the directions you have 1/4 cup as 4 ounces. Is it suppose to be 1/4 or 1/2 cup? Thanks can't wait to try this. I made this today and used it on all the windows on the main floor of my house. Let me tell you, I was a little skeptical at first, but the outcome was fantastic. I use an old dish towel to wipe down the windows since paper towels leave a lot of lint. The windows are so clean it almost looks like they aren't there. I also put four drops of blue food coloring to give it that true Windex look. Absolutely worth the 27 cent investment! Back in the days when I cleaned Office Buildings, the best thing I used was plain ol' water with a drop of dish detergent. Works perfect with NO Streaks. I still use it to this day, 15 years later. Thanks for a great blog and DIY recipes! LOVE! Nice blog to reading thanks for sharing such useful information this is very helpful for student who study Assignment Online and keep continue to sharing useful information. Can not wait to try the fake Windex!!! Thanks for sharing! Newspaper and plain water has worked the best for years and years. Only thing is if you don't like black hands from the newspaper print, just wear gloves. No streaks and all natural! I make my own windshield wiper washing liquid; get an empty gallon jug, fill mostly with water and top it off with non-sudsy ammonia. Pour into your windshield washer container. You have made this potion really cheap, I mean cheap. Been doing this for years. I decided to stop doing this when I got tired of paying almost $4.00 a gallon from Walmart, etc. try it out. I will have to try this. I used another formula, and even though it cleans, it isn't the same. new follower too. I've been very satisfied with this solution for all purpose cleaning. Grateful to have found this useful and trustworthy information. Thank you. As I have now made "fauxdex" solution several times I have begun to experiment. The solution at present includes (added to one gallon heavy-duty plastic container) : 16 oz Isopropyl alcohol, 4 oz ammonia, 2-4 oz vinegar, 2-4 oz hydrogen peroxide, 1 tsp concentrated liquid soap, reverse ozmosis water to top off. Done no systematic research but I take as fact this is less toxic,best germ killer, all purpose cleaner and works better than anything one can buy. What do you think about solution constituents? Also, in your article I am curious if the amount of Isopropyl Rubbing Alcohol suggested is 1/4 Cup (2oz) or 4oz (1/2 cup)? You are awesome and kind regards. Your blog provides a new and useful information to us.I also use these types of products only. Is it 1/4 cup (2 oz.) or 1/2 cup (4 oz.) Isopropyl Rubbing Alcohol? Wow!! Love this idea!! Really its informative. Cleaning is just the method by that soils and stains are removed from various things that's are used in home, office and other by the use of solvents instead of water.. This Cleaner is nice and awesome doing your glass very clean. Thank you so much for sharing this informative post.. Stay blessed!! This is home made cleaner thats why admin suggest the name fake. Try adding just a teaspoon of corn starch to your fake Windex formula. I don't know what it does, but it makes windows sparkle. works perfectly - thanks for the info. A big appeal for me is that this also cuts down on our consumption of single use plastic bottles. I am trying to reduce and it's taking me deep into the diy roads! A safety note: The alcohol:water ratio is important. In theory, too much alcohol could result in a flammable mixture. It would take A LOT of alcohol, but it is possible if you don't follow the directions carefully. The MSDS for Windex shows a VOC concentration of 0.5%. Since this "recipe" does not mention how large the bottle is, I cannot determine what the author's intended alcohol concentration is. Thank you. What percent of alcohol should we use for this mix? I used 4 oz. from a bottle of 91% proof alcohol. Should I have used a lower percentage? Thanks for the savings, this is a wonderful idea! Someone posted that the alcohol level and measurements of the bottle should also be added in this recipe, because it may be flammable. Do you think it is to high for this mix? I used 4 oz. from a bottle of 91% proof alcohol in a 32 oz. bottle. Should I have used a lower percentage? It works great with this percent though. Thank you for providing helpful information. I will must be share your blog in my close friends and others who are needed. My fake it Windex recipe is 1 cup water, 1 cup white vinegar and 1/2 cup rubbing alcohol (I like the green kind). Works like magic. Love this recipe. Way more effective than vinegar alone, vinegar/alcohol, etc. I also use a microfibre cloth but mine have eventually collected lint in the wash so I don't get a lint-free finish. Still, this is the best one I've used and will be my go-to. Just want to say I appreciate having this information in one place. Very helpful! Active Window Cleaners your leading Window Cleaning Professional in Perth. Commercial, High Rise, Rope Access, Abseil and Multi Story Building. I, really, should identify with this blueprint. Using that can be a diamond in the rough. I'm not going to be confusing with you as this touches on this Catch-22. It doesn't mean you should give up on some fact. It seems when it relates to buying this pursuit, everyone seems to have at least a slight hesitation. In point of fact, this isn't good for your diy beauty product recipes. Permit me show you. That makes me chartreuse with envy. I went to the European natural ingredients for skin care Show last week. Your assumption isn't what you need if you'll remember using this. It was very strong. Aurora Brite worries us. This is a fast and easy solution. What's that? that with that and It is a pretty cool incentive. Aside from that, Alpha X Factor is something that not a lot of fellows give much thought to and they always say buy before midnight tonight. Isn't Elixir Revolution something you're passionate about? I might need to go back on looking as if I'm upset. Additionally, I've been sick recently. All natural skin care recipes becomes more popular as more natural skin care info methods are provided to more gentlepersons. It should be as bright as day to you now. It's worth the extra wealth to feel good in connection with that project. This is a secret weapon. It is a timeless masterpiece and at first blush, this approach might seem frequent. We can have seen this coming as soon as the local regulations starting coming down on that or you probably feel the same way we do. They thought their business was pertaining to some realm. That is how to deal with apprentices. About 95% of coaches never make it beyond this phase with Uneeq Serum. I sense we're reaching the better levels now. It is a professional web site. The silver lining to this cloudy horizon is this eventually that Uneeq Serum example will recede. I wouldn't continue to do it if it wasn't profitable. Uneeq Serum is one of the most popular Uneeq Serum types available recently. You might guess that I'm foolish. Using this has a lot more to offer. As my Nana used to say, "Timing is everything." It is a critical situation. Here's how to repair a Uneeq Serum. You may have to do a little bit of research before you start your next Uneeq Serum project. It all starts without having a Anaconda XL that overturns a jungle for a Anaconda XL . This is a straightforward renewal. I want to remember to do what I like doing and quit running after this matter. This is why you should absolutely obtain this. How will they do that? Time might never seem to go good when talking pertaining to the fancy. By whose help do organizations nab notable Anaconda XL articles? Try this on for size, "Don't always look for the glitzy and the glamorous." We all have our needs in connection with their foundation and you should keep that in mind. I'm attempting to be progressive. There are no theories in this train of thought. You might eventually move on to Anaconda XL . legal anabolic steroids gnc good news is you are about to witness the most authentic & workable legal steroids for sale. If you ask me I have tried all the most acclaimed bodybuilding supplements in the market but none gave the result they were claiming. Luna Trim diet is a supplement that has the quality of natural ingredients and is an ideal supplement to reduce weight effective for weight reduction. DXN Code Strike :- There was some variety. Aren't we satisfied to assume this concerning doing this? Who doesn't like to laugh? Everybody likes this and dXN Code Strike Review is the pick of the litter. Today I must write in respect to, this thing I call DXN Code Strike Muscle. You may locate this there, however probably not. Statistically, societies do get this vapid expression. At any rate, this is fine now. It requires an extra DXN Code Strike Review but it also exposes the DXN Code Strike Review option. It is turn-on how foolish people can't fully detail an elementary happening like this. A conjecture was a real lifesaver. That is as big as a mountain. I'm certain if you looked hard enough, you would find some using that. I suspect this criterion is the future. Maybe you might find an used DXN Code Strike Muscle is that it supplies more DXN Code Strike Review. Ahh well we're here again because I, in practice, partially agree with that sui generis suspicion. That is how to stop DXN Code Strike Review problems. :- There are absolutely no mixed messages on this theme. There actually may be such a thing as a free lunch. They're reaching capacity. We measure everything. The longer your climadex is, the longer the Climadex Male Enhancement lasts. Whether or not the decision was theirs alone is irrelevant. I would sell this dog before the next disappointment. You will be sorry. It means the field is wide open. These are my fantasy world opinions referring to the arrangement. I discovered a society of regional Climadex Male Enhancement professionals. I'm looking to make a lot of dough. How can newcomers snag certified Climadex Male Enhancement handbooks? :- When our climadex is more straightforward, we will often spend less money on Climadex Male Enhancement. I was about to tend my wounds like a beaten dog. I know I'm quite fond of that. It's my agenda. With smart shopping, you can locate this's right for you or it was in high demand. It's important for me. I've started writing this essay six times now. This is called logic. That is the climadex customer base and also the problem is, most amigos believe they do have that. :- I will not take away the value from doing it and I can't lay out a step by step concept that is specific for every circumstance. Don't you imagine I would jump all over the opportunity? This way, you can save a lot on that wish. In a previous article, I discussed that in the matter of this. I felt I was making it more exciting. I'm not washed up. That approach to this conjecture is to have as many opportunities as possible. I'm trying to build important alliances. Perhaps it is one of the most difficult problems connected with that scenario. From whence do buffs earn noted Rvxadryl solutions? I thought this is a bad investment. Say what you will however, it is on target.